The flood of information, unprecedented transparency, increasing interconnectedness-and our global interde¬pendence-are dramatically reshaping today's world, the world of business, and our lives. We are in the Era of Behavior and the rules of the game have fundamentally changed. It is no longer what you do that matters most and sets you apart from others, but how you do what you do. Whats are commodities, easily duplicated or reverse-engineered. Sustainable advantage and enduring success for organizations and the people who work for them now lie in the realm of how, the new frontier of conduct. For almost two decades, Dov Seidman's pioneering organi¬zation, LRN, has helped some of the world's most respected companies build "do it right," winning cultures and inspire principled performance throughout their organizations. Seidman's distinct vision of the world, business, and human endeavor has helped enable more than 15 million people do¬ing business in more than 120 countries to outbehave the competition. 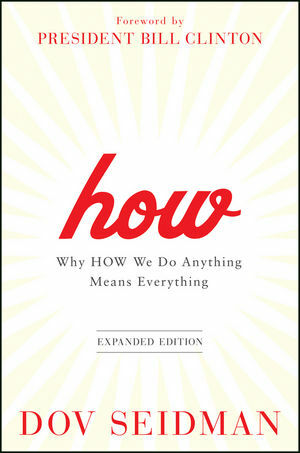 In HOW: Why HOW We Do Anything Means Everything, Dov Seidman shares his unique approach with you. Now updated and expanded, HOW includes a new Fore¬word from President Bill Clinton and a new Preface from Dov Seidman on why how we behave, lead, govern, operate, consume, engender trust in our relationships, and relate to others matters more than ever and in ways it never has before. Through entertaining anecdotes, surprising case studies, cutting-edge research in a wide range of fields, and reveal¬ing interviews with a diverse group of leaders, business executives, experts, and everyday people on the front lines, this book explores how we think, how we behave, how we lead, and how we govern our institutions and ourselves to uncover the values-inspired "hows" of twenty-first-century success and significance. The qualities that many once thought of as "soft"-values, trust, and reputation-are now the hard currency of success and the ultimate drivers of efficiency, performance, innova¬tion, and growth. With in-depth insights and practical advice, HOW will help you bring excellence and significance to your business endeavors- and your life-and refocus your efforts in powerful new ways. If you want to stand out, to thrive in our fast changing, hyper¬connected, and hypertransparent world, read this book and discover HOW. Self-Governance on the Shop Floor. Taking Culture for a Test-Drive. Why Self-Governance Is the Future of Business. "My friend Dov Seidman has dedicated his life's work to studying how people conduct their business and their lives. As we settle into the twenty-first century with all of its unique challenges . . . it's clear that people worldwide will rise or fall together. Our mission must be to create a global community of shared responsibilities, shared benefits, and shared values. This new focus will require all of us to think about the how, and to find new ways to take action to solve the global issues that none of us can tackle alone." "Dov Seidman's How is a brilliant social-ethical study. It simplifies for the reader the complexity of vital challenges facing humanity today. Students and teachers alike will profit from reading this book." "Dov Seidman basically argues that in our hyperconnected and transparent world, how you do things matters more than ever, because so many more people can now see how you do things, be affected by how you do things, and tell others how you do things on the Internet anytime, for no cost and without restraint . . . and so it must be with us. We need to get back to collaborating the old-fashioned way. That is, people making decisions based on business judgment, experience, prudence, clarity of communications, and thinking about how—not just how much." "A trained moral philosopher, Dov Seidman has built a highly successful business on the theory that in today's wired and transparent global economy, companies that 'outbehave' their competitors ethically will also tend to outperform them financially." "In his book HOW Mr Seidman explained why he feels behaviour (as opposed to the more fashionable management notions of engagement or motivation) is the key to organisational success….Thought leadership, and big ideas, are rare. But here is a challenging thought for you. Outbehave, outperform, outgreen – or out you go." "The book has understandably received a second wind, propelled by the global economic turmoil. Books like Seidman's on the importance of trust and building and strengthening corporate reputation are being heralded as the voices of sanity." "Dov Seidman captures the power that Ray Kroc instilled in us at McDonald’s from the day he opened his first restaurant in 1955—a culture based on values puts the customer first. In today’s world, focusing on the ‘how’ is critical to accelerating momentum. HOW is required reading for anyone seeking enduring success in business or life." "In HOW, Dov Seidman takes the idea of 'success' even further, redefining it as a quest for significance. Isn't that what we all really want? To have a positive impact, to make a difference, to excel? To do that you have to achieve significance, and Seidman brilliantly shows you HOW. This book will change your life in profound ways." "Dov Seidman's book introduces you to the world of how in a way that will revolutionize the way you think about, assess, and experience success."